Rows of sleek, black SODI RT8 go-karts vibrate at the start of TBC Indoor Kart Racing’s 1/5-mile track. Drivers hover 2 inches above the ground, anxiously awaiting the moment they can slam down the gas pedal and accelerate their vehicle capable of reaching speeds of up to 75 km/h. Everyday from 10 a.m. until midnight, an adrenalin-fuelled parade of karts hugs the course’s 13-turns as drivers 11 and older flex their navigational muscles and best their times using a high-tech digital timing system. In between laps, video games and air hockey occupy fingers itching for the steering wheel. 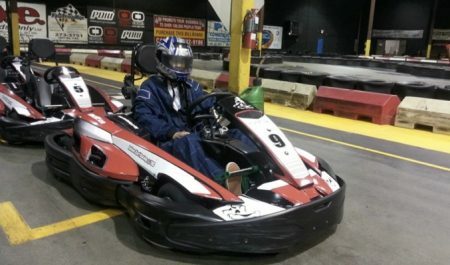 The family-friendly environment, kept fume-free via the karts’ clean air exhaust systems, hosts solo riders, as well as groups that can rent out the full service banquet meeting room to celebrate a birthday, Christmas party, corporate event, or just a fun afternoon with friends. Promotional value expires 90 days after purchase. Amount paid never expires. 3-day advance booking allowed and recommended; subject to track availability. Limit 3 per person, may buy 2 additional as gift(s). Limit 1 per visit. Not valid with other offers or promotions. Merchant’s standard cancellation policy applies (any fees not to exceed voucher price). 24-hour cancellation notice required. Merchant is solely responsible to purchasers for the care and quality of the advertised goods and services.